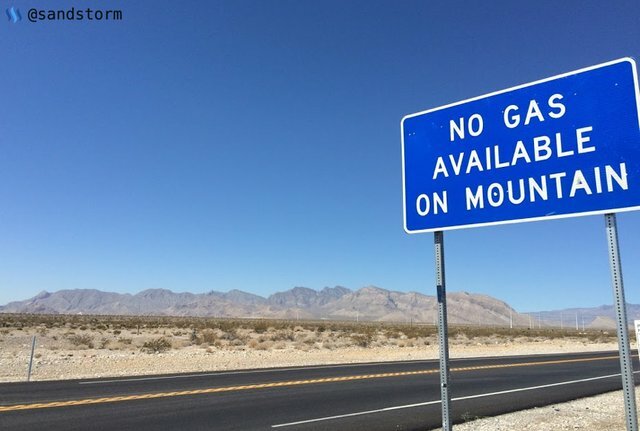 📷 Travel Photography - No Gas On The Mountain! When you’re driving in the mountains, beware of this sign, it is your last warning for what does or doesn’t lie ahead. No gas from this point forward, check your tanks and proceed with caution! Who loves living on the edge? Follow @sandstorm for cool lifestyle, travel, and food content. Where we are going, we don't need gas, our love for Satan is all we need to get us to where we want to go. Am I right? Congratulations! This post has been upvoted from the communal account, @minnowsupport, by sandstorm from the Minnow Support Project. It's a witness project run by aggroed, ausbitbank, teamsteem, someguy123, neoxian, followbtcnews, and netuoso. The goal is to help Steemit grow by supporting Minnows. Please find us at the Peace, Abundance, and Liberty Network (PALnet) Discord Channel. It's a completely public and open space to all members of the Steemit community who voluntarily choose to be there.